windows artists were able to exploit the opportunity created by vast openings in the wall to fill them with light, colour, and narrative. In France, the pictorial culture of the 13th and 14th centuries is represented far more strongly by the stained-glass masters of Chartres, Bourges, and the Sainte-Chapelle than by fresco painters. Gothic painting developed its own rich style, both religious and secular, north of the Alps. A fluid linear quality typified manuscript drawing, while an increasing naturalism replaced the exaggerated Romanesque style. While only vestiges of wall paintings remain, these, along with the illuminations, reveal subject matter mainly from the Old Testament, the Apocalypse, the childhood of Christ, the life of the Virgin, the Passion and the Last Judgment. Pictorial art in Italy followed a different course, emerging as altarpieces, fresco cycles, and painted crosses. The great altarpieces. which were particularly characteristic of central Italy, became progressively structured in large compositions, yet most have since been broken up and dispersed into private and museum collections. Furthermore, many of the fresco cycles have suffered irreparable over-painting and erasures throughout the years. In Spain, the principal medium for pictorial culture was the reredos, a large compartmentalized screen behind the altar, either painted or sculpted. On the Iberian peninsula, this genre attained a level of experimentation and grandiosity unknown anywhere in Europe, to the point of becoming a major architectural element. At this time, the most readily communicated art form throughout Europe was the miniature. The popularity of illustrated books grew to become an expression of the ideas and tastes of the rich and scholarly. These books typified Gothic art. which increasingly favoured naturalistic forms and miniature scenes from everyday life. The complex profile of Italian painting was dominated by a radical change that took place at the end of the 13th century in Umbria and Tuscany (Assisi, Florence, Siena); this was the arrival of a new artistic language that marked the confluence of various influences. Of these, the most significant were the Romanesque tradition of western Europe, concentrated in the Po Valley; the Byzantine, along the Adriatic and in the south; and the classical, still active, especially in Rome and the surrounding regions. The historical importance of the renewal of the figurative arts - led in painting by Giotto and Cimabue, and in sculpture by the great Pisano brothers and Arnolfo di Cambio - lies therefore not so much in the artists' rejection of the late Byzantine influence as in the richness of their realistic synthesis. The Byzantine culture had produced mosaics and painted fresco cycles of quality, as in the decoration of San Salvatore in Chora. The vibrant luminosity and the narrative style revealed in the distinctive and individual altarpieces and fresco cycles testify to a coloristic and compositional freedom far from the concepts of a mystic and divine space usually associated with the Byzantine heritage. Of great significance was the work of Il Cavallini and of Filippo Rusiti (active 1319-30), who represented the classical Roman school of the 13th century, and whose frescos and mosaics show an important link between their style and the concrete conception of reality created by Giotto in the pictorial cycle of St Francis of Assisi. With the first defeat of the Swabians in 1266. Charles I came to rule over southern Italy and strengthened the development and culture of Naples, in close relationship with the pontifical court and with the Guelph bankers of Tuscany (the Guelphs were members of a medieval Italian political party that supported the papacy against the German emperors). However, he retained the ties with the French court and Provence. These political and economic factors made for a great mobility in artistic forms, in which, in the 14th century, exceptional figures emerged. Italian painter and mosaicist. 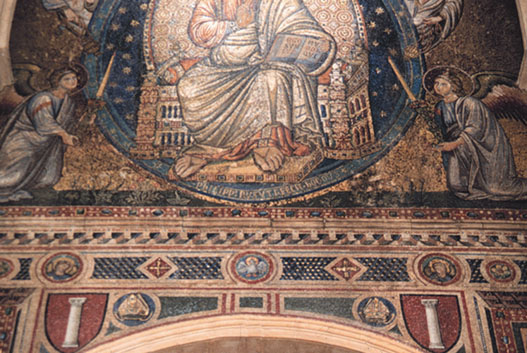 His only certain work is the mosaic on the façade of S Maria Maggiore, Rome, which is signed on the mandorla of Christ. He served as ‘King’s painter’ in France during the reigns of Philip IV and Louis IX, receiving payments in 1304/5, 1308 (for repairs in the Grande Salle of the royal palace at Poitiers), 1309, 1316 and 1317, but none of this work survives. His workshop was in Calle Cucurulla, Barcelona, and commissions from a variety of patrons, mostly royal, are documented. In 1324 he was paid for painting two chapels and two crosses for the church at Sitges. Between c. 1333 and c. 1335 he illuminated a book on the Usages of Barcelona and Customs of Catalonia for Alfonso IV of Aragon, and in 1335 he was paid for an altarpiece. Further payments, in 1339 and 1340, were for two altarpieces for the chapel of the Aljafería Palace (a Moorish palace) in Saragossa. 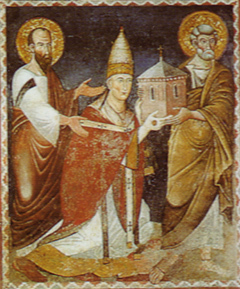 About 1340 he received a commission for an altarpiece of St Hilary for the diocese of Lleida (Sp. Lérida). 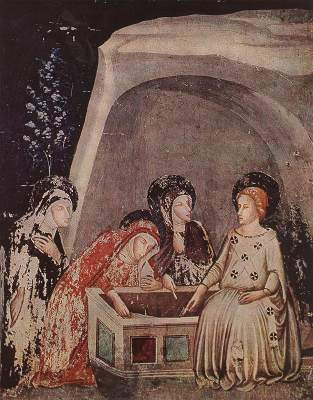 In 1341 Bassa had begun work on three altarpieces for the Episcopal See at Lleida, commissioned by Ot de Montacada (c. 1290–1341). In 1342 Peter IV (the Ceremonious) of Aragon asked his wife, Maria of Navarre, to send him a Book of Hours illuminated by Ferrer Bassa, and in the same year the artist was also paid for a commission by Queen Constanza of Mallorca. In 1343 and 1344 he was paid for an altarpiece and other works for the chapel of the Aljafería Palace in Saragossa and for an altarpiece for the chapel of the royal palace at Barcelona. In 1344 Bassa was commissioned to decorate the S Miguel Chapel, then the cell of the abbess in the Pedralbes Monastery, Barcelona, although he only started work in 1346. He was involved in further royal commissions in 1345, including an altarpiece for the chapel of the castle at Perpignan. 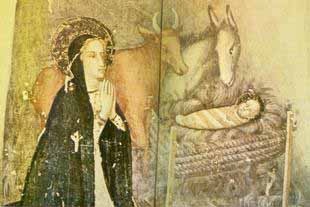 In 1346 Pedro asked him to send the altarpieces for the chapel of the castle at Lleida. A document of 1347 concerns the painting of an urn for the monastery of Ripoll. In 1347 and 1348 Ferrer Bassa and his son (2) Arnau Bassa received joint commissions for altarpieces from Guillem de Torrelles and the Pedralbes Monastery, as well as from other patrons. 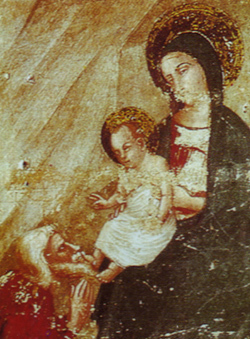 Madonna and Child, detail of fresco. San Miguel Chapel, Convent of Pedralbes, Barcelona, 1345-46. Bassa's work shows the influence of Sienese culture. Employed at the Aragon court, he studied at the Papal Palace at Avignon and shared with Lorenzetti a lively naturalism.